In this grammar lesson and activity, students learn about indefinite pronouns through word play. The printable packet includes "Rules to Remember," a practice page, and answers. 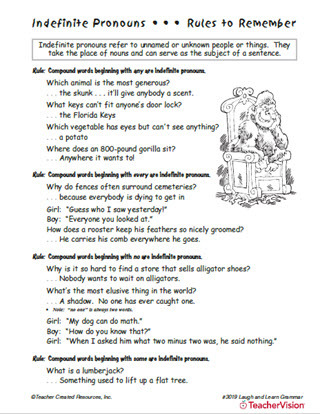 The fun-filled lessons and practice activities in Laugh and Learn Grammar capitalize on students' natural interest in word play by using jokes and riddles to teach grammar and usage. Topics include proper nouns, helping verbs, conjunctions and more!